1. John Cochrane discusses the Nobel lectures. The part about Shiller is particularly good. 2. Why Abenomics will disappoint, by Martin Wolf at the FT. My takeaway is that Japan should drive up final consumption by transferring income from the corporate sector to the household sector, and that raising the consumption tax will not accomplish that. 3. Capital ratios of European banks. 4. 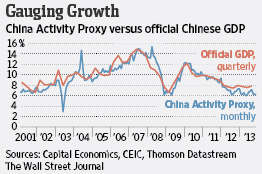 China's actual GDP growth rate might be 1.5 to 2 percentage points lower than the official figure. Article in the WSJ blog, with data from Capital Economics.